Save money today on some of our most popular products with these complete gauge packages. Bosch’s Sport line is designed for modern cars interiors with a subtle metallic body and smooth exterior finish. Having more than 125,000 people exposed to your new product in an isolated environment can never be a bad thing. 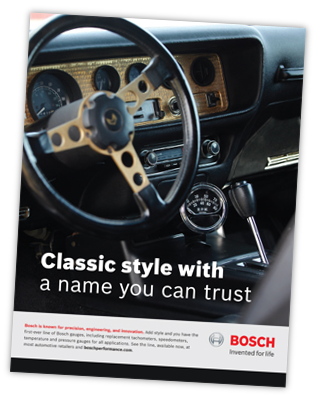 In debuting our first-ever line of gauges, we dipped into Bosch’s storied racing heritage. From injectors to spark plugs and more, Bosch helps cars perform at their finest.